A prairie is a diverse ecosystem of native grasses and flowering plants (forbs) with prairie wildlife, soil, geology, and fire playing an integral important role. Westcave Preserve is located in the Hill Country of the Edwards Plateau, one of eleven ecological regions of Texas. The Edwards Plateau is an uplifted and elevated region originally formed from marine deposits of sandstone, limestone, shales, and dolomites. One hundred million years ago during the Cretaceous Period when this region was covered by an ocean. The western portion remains a relatively flat elevated plateau, whereas the eastern portion, known as the Hill Country, is deeply eroded. Historically within this ecological region a mosaic of plant communities, with Mixed Grass Savanna and Prairie presumed to have been a large component of the landscape. Over the years the prairies of the Hill Country have all but vanished from our landscape due to, fire suppression, over grazing and other human impacts. In early 2016, Westcave reintroduced fire, by way of a prescribed burn, as part of the prairie restoration process. Through this land management tool the goals were to safely, reduce invasive and non-native plant species and to encourage a native and diverse vegetation community. 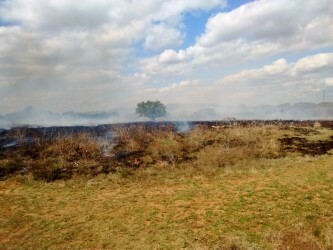 The prescribed burn was essential to helping create a native prairie restoration demonstration area that would help to control woody, invasive species and non-native grasses. This would lead the way to re-vegetate the area with native grass seeds and flowering forbs. After the burn, staff and volunteers set out to recreate this native prairie demonstration area. The area was tilled and then reseeded with native grasses and tilled again. In the Fall the prairie area will be reseeded with native flowering forbs that will provide great forage for wildlife. Photo points have been established as a means to monitor the progress or regrowth and re-establishment of grass and forbs over several years’ time. It consists of repeat photography of an area of interest over a period of time, with photographs taken from the same location and with the same field of view as the original photo. The prairie restoration area will be sustained through periodic burns, reseeding, and monitoring.